Offering you a complete choice of products which include needle destroyer and syringe destroyer. We at, Bhasin Sons Private Limited are engaged in manufacturing and exporting a wide range of Needle Destroyer or Syringe Destroyer. We use modern technologies and machineries for the process of manufacturing these destroyers. Our products are significantly featured to be power saving and maintenance free. These destroyers plays vital role in hospitals in the process destroying used and contaminated syringe and needles, which avoids infection. Weight : 3 kg. Approx.net. SIZE 165mm x 115mm x 120mm Handy desktop model. POWER 320 voltage Â±10%, 50 hertz, single phase. PROTECTION 2 ampere 3/4 cartridge fuse. We ar Basisnsons are the leading manufacturer, supplier and exporter of Syringe Destroyer. 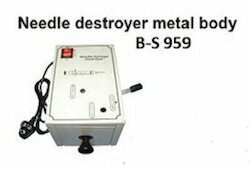 The Needle destroyer or syringe destroyer is used to cut the neddle right from the hub. The product is is avaialbe in plastic or metal bodies. 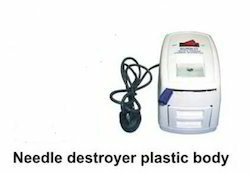 Looking for Surgical Needle Destroyer ?